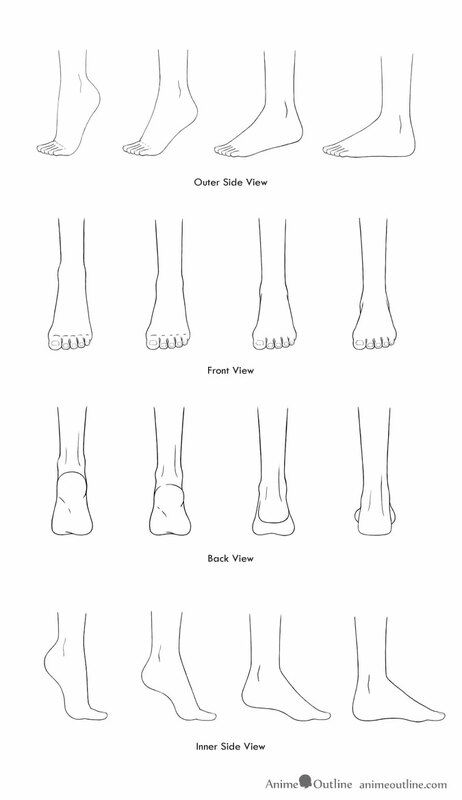 This tutorial provides some tips on drawing feet in the anime and manga styles in several different positions from different views. You may also want to check the the How to Draw Anime and Manga Feet From Different Views tutorial before looking at this one if you have not already done so. It provides some detailed instructions on the basics of drawing feet. Always start by drawing the overall shape/major shapes of the foot first. If you are not simply drawing a scene that is zoomed on the feet but the whole person then you should start by drawing the overall proportions of the person first. When drawing feet there are two major parts to consider, the foot itself and the toes. While the toes can move individually, during most normal movement of the foot they usually stay together. Although we are focusing on feet in this tutorial it’s also very important to be aware of positions of the legs in relation to the feet. It’s easy to lose track of the position of the legs and the rest of the body if you are drawing only the feet but you should keep those in mind. Being aware of everything can help prevent you from making mistakes. If we again use the example of someone standing up on their toes the position of the leg in relation to the foot will not change the more the person stands up on their toes. The legs will remain upright. Remember to keep the proportions (length, height, etc…) of the foot the same between different positions. It is also very important to stay consistent between different views of the same object. For example if the foot you are drawing is at a certain angle when shown in one scene of a manga you want to keep that the same when showing the same foot from a different view in a another scene (as long as the character you are drawing does not move).